This week’s theme is Easter candy, items for the home and bedroom, cleaning products and household supplies, gardening items, pet accessories, and children’s socks. 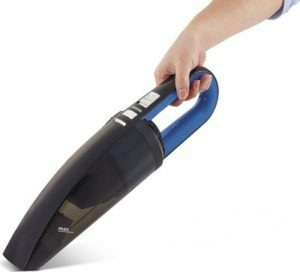 Easy Home Handheld Wet/Dry Vacuum, $19.99. This includes a brush nozzle, wet suction nozzle, and crevice nozzle. Choceur Premium Chocolate Easter Bunny, $2.29 for 4.23 oz. Choceur Milk Chocolate Coins or Solid Milk Chocolate Eggs, $1.99 for 4.58–7.05 oz. Choceur Chocolate Easter Figurines, $2.99 for 8.8 oz. Specially Selected Chocolate Truffle Eggs, $3.49 for 5.29 oz. Choceur Chocolate Surprise Egg, $4.99 for 12.35 oz. Starburst Original Jelly Beans, $1.95 for 14 oz. Cadbury Mini Eggs, $2.95 for 10 oz. Mars Minis Mix, $2.99 for 10.5 oz. Includes 3 Musketeers, Twix, Snickers, and Milky Way. Huntington Home 4-Piece Reversible Bedding Set, $29.99. Queen or King in assorted colors. Huntington Home 50″ x 70″ Feather-Soft Throw, $9.99. 100% Polyester. Choose Pink, Navy, or Gray. Huntington Home Copper Bed Pillow, $8.99. 100% Cotton, copper infused, with 100% antimicrobial Polyester fill. Huntington Home 4-Piece Sheet Set, $14.99. 100% Polyester Microfiber. Choose Pink, Navy, or Gray. SOHL Furniture Leaning Bookshelf, $39.99. Measures 25.1″ W x 14″ D x 72″ H, with a 20-lb. weight capacity per shelf. Easy Home Woven Tote Assortment, $7.99. Three-piece or 4-piece set. Assorted colors. Easy Home Woven Strap Hamper with Liner, $9.99. Removable liner. Assorted colors available. SOHL Furniture Tufted Storage Chest, $69.99. Measures 37.80″ x 17.7″ x 16.93″. Easy Home Steam Mop, $34.99. Easy Home Wet or Dry Cloth Refills, $4.99. Compatible with Swiffer Sweeper Dry Cloths. Choose 32-ct. Dry Cloth Refills or 24-ct. Wet Cloth Refills. Easy Home Folding Step Stool, $6.99. 300-lb. weight capacity. Assorted colors. Read our review of the step stool here. Easy Home Angled Broom with Dustpan or Microfiber Flip Mop, $6.99 each. Easy Home High Reach Cleaning Kit, $14.99. Includes cobweb duster, bendable microfiber duster, suction cup bulb changer, and dual window washer squeegee. Easy Home 12.78-Gallon Lockable Step-On Wastebasket, $14.99. Easy Home Hand Held Steam Cleaner, $19.99. Cleans, disinfects, sterilizes, and kills germs. Read our review of Aldi’s hand held steam cleaner here. Gardenline 4-Tier or Drop-Over Greenhouse, $14.99. Choose a 4.5′ x 4.5′ Drop-Over Greenhouse or a 4-Tier Greenhouse. The 4-Tier Greenhouse is approximately 5′ H. Read our review of the 4-Tier Greenhouse here. Gardenline Raised Garden Bed, $29.99. Measures 4′ x 4′. Read our review here. Gardenline Long Handle Garden Tool Assortment, $8.99 each. Choose a Garden Hoe, Drain Spade, Square Shovel, Round Shovel, or Rake. Suncast Multi-Purpose Cart, $19.99. Measures 22″ x 19.5″ x 23″. Features a 15-gallon capacity. Gardenline Mesh Garden Fencing, $9.99. Measures 3′ x 25′ per roll. Protects plants from rodents and small animals. Gardenline Garden Soil, $2.99. Feeds up to 4 months. For flowers, vegetables, trees, and shrubs. Natural and organic. Contains 1 cu. ft.
Suncast Border Stone Edging, $12.99. Contains ten 12″ x 1.75″ x 5.75″ sections per box. Read our review here. Preen Garden Weed Preventer, $11.99. Blocks weeds for up to 3 months guaranteed. Covers 900 sq. ft.
Gardenline Outdoor Power Cords, $8.99. Choose a 50′ Outdoor Extension Cord or 25′ Triple-Tap Outdoor Extension Cord. Heart to Tail Pet Carrier Tote, $12.99. For pets up to 15 lb. Measures 11.3″ x 8.5″ x 10″. Heart to Tail Pet Leash or Dog Harness, $5.99 each. Assorted varieties. Heart to Tail Pet Collars, $3.99. Assorted sizes. Heart to Tail Orthopedic Pet Mat, $12.99. Measures 25″ x 16″ or 33″ x 20″. Heart to Tail Pet Training Pads, $6.99. Choose 50-ct. Standard or 30-ct. Extra Large. Heart to Tail Dog Grooming Pack, $12.99. Includes shampoo, body deodorizer, wipes, combo brush, and undercoat rake. For sensitive skin. Heart to Tail Pooper Scooper, $7.99. Collapsible. Extends to 25″. Heart to Tail Medium or Large Dog Run Cable and Stake, $7.99. Medium for up to 60 lb. or Large for up to 100 lb. Heart to Tail Exercise Playpen, $39.99. Eight panels. Measures 36″ x 22.8″ (91.44 cm x 57.91 cm) per panel. Heart to Tail Wire Kennel with Divider, $39.99. Measures 36″ L x 21.85″ W x 24.40″ H. 70-lb. max. pet weight. Heart to Tail Cat Scratching Post or Corner Condo, $12.99. Assorted varieties. Heart to Tail Pet Perch, $16.99. Measures 24″ W x 14″ D x 1.5″ H. 35-lb. weight capacity. Lily & Dan Toddler 6-Pair Socks, $3.99 each. Lily & Dan Boys’ 6-Pair No Show or Low Cut Socks, $4.99 each. Lily & Dan Girls’ 6-Pair No Show, Low Cut, or Crew Socks, $4.99 each. Fresh St. Louis Pork Spareribs, $1.99 per lb. Thomas Farms Fresh Ground Lamb, $5.99 for a 1-lb. package. Cadbury, Choceur, Easy Home, Gardenline, Heart to Tail, Huntington Home, Intex, Lily & Dan, Mars, Preen, SOHL Furniture, Suncast, Thomas Farms. Bookmark.